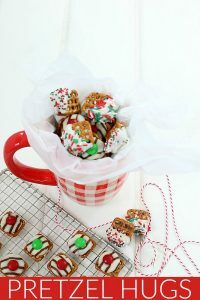 Are you looking for a super easy, fun treat to give as a gift or add to your Hot Chocolate Bar? 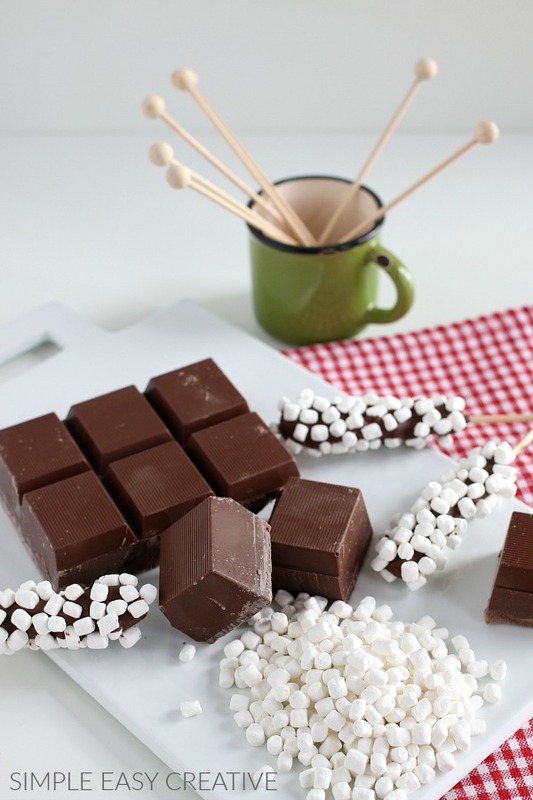 These Hot Chocolate Stirrers go together in minutes and add a special touch. 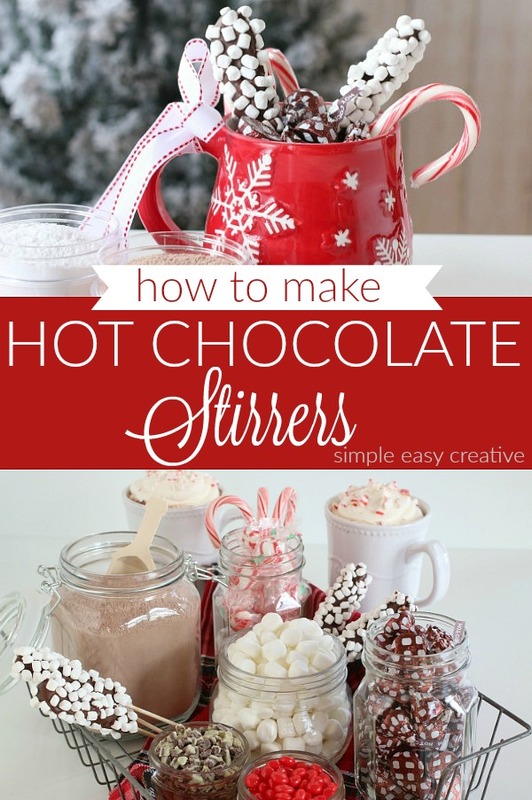 These Hot Chocolate Stir Sticks make great gifts for the holidays, but let’s not forget all those evenings that you are curled up by the fire in January, watching the snow fall. 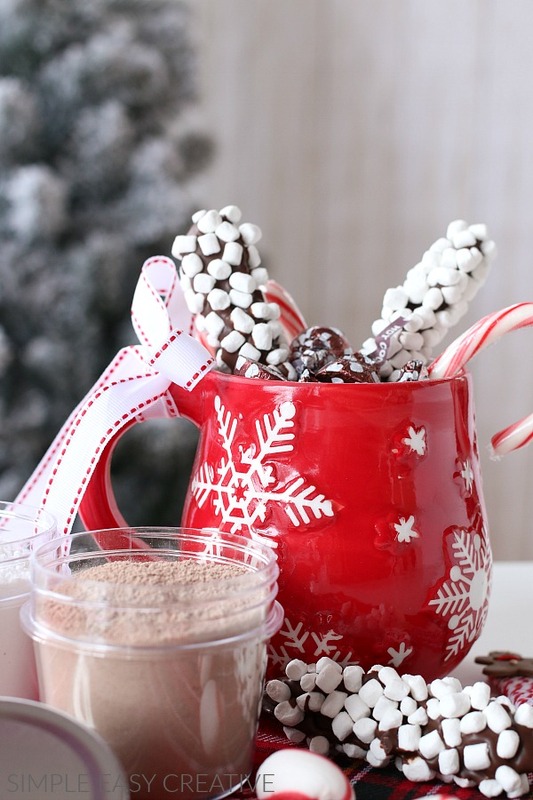 There isn’t anything better than a hot cup of cocoa – well with chocolate stir sticks added, of course! 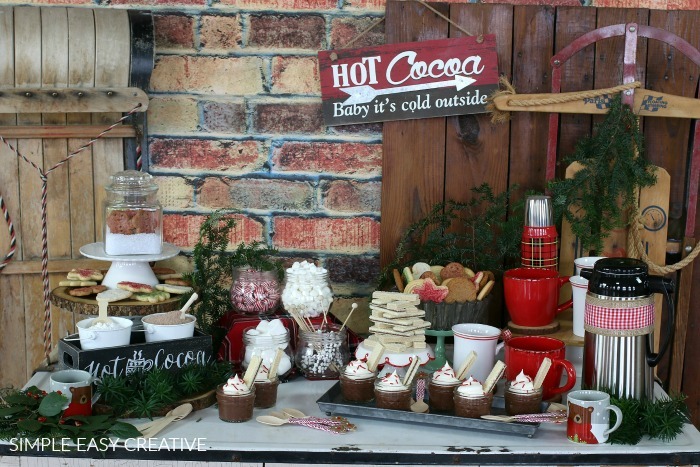 Did you spot the Hot Chocolate Stirrers on the Hot Chocolate Bar? They make such a fun addition, and the kids love to make them too! 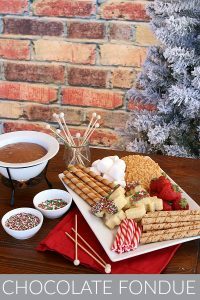 All you need to make these Hot Chocolate Stir Sticks are 3 simple supplies – Sticks (any will do, but I think these rock candy sticks are really fun), Chocolate, and Mini Mallow Bits. These sticks are super easy, however I have found a few tips that I think will help you. Maker’s Tip #1: Chocolate – having a good melting chocolate is essential. Almond Bark (either chocolate or white) is my go-to chocolate. It melts really well, and is super easy to work with. Maker’s Tip #2: Melting Chocolate – the key to getting the right consistency and not burning the chocolate is to stop cooking before it’s completely melted, then stir until it’s smooth. The amount of time to cook will depend on the amount of chocolate. 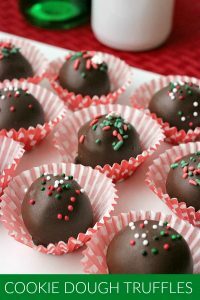 For 2 blocks of chocolate, melt in the microwave for 1 minute, then stir. Then continue cooking in 10 second intervals. Stop just before the chocolate is melted. It will have small pieces not melted. Maker’s Tip #4: Have everything ready to go before you begin. 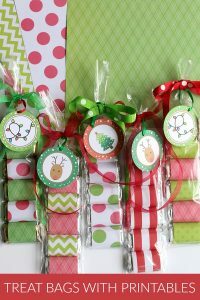 Lay out parchment or wax paper onto a cutting board or plate – something that will fit in your freezer. Pour the marshmallow bits onto a plate. Maker’s Tip #5: Make extra! Everyone will love these! Maker’s Tip #6: If you don’t want to use wooden sticks, you can also use peppermint sticks, spoons or straws. 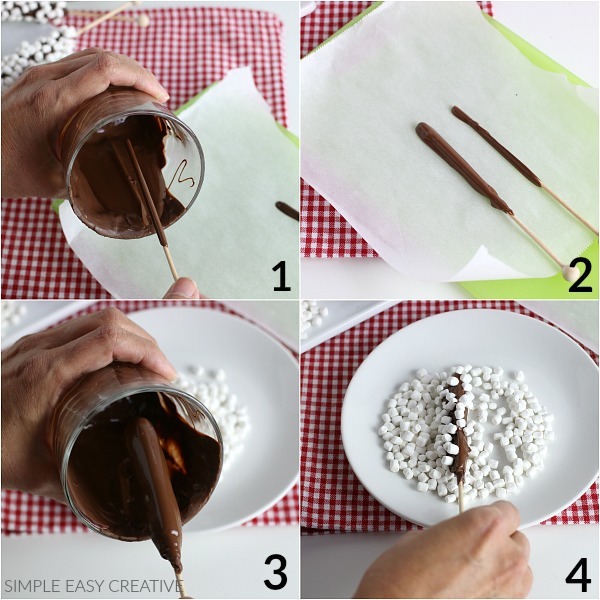 On the final dip, immediately roll the chocolate in the mallow bits. Place on paper until firm. Now you are ready to enjoy a big mug of hot cocoa! Have all the ingredients ready in a basket for your guests, gift as a gift or enjoy while you are watching a Christmas movie! 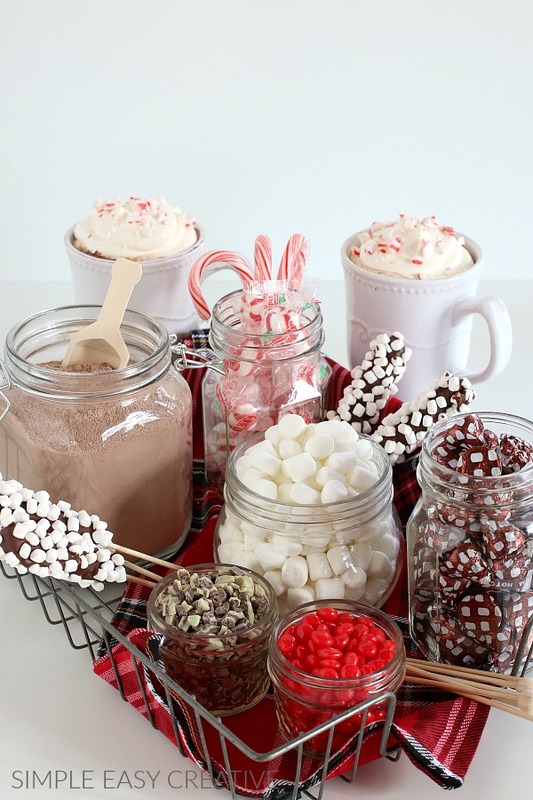 For this basket, we added the Hot Chocolate Recipe, Hot Chocolate Stirrers, Hot Cocoa Candy Kisses, Mini Marshmallows, Red Hots Candy, Andes Mints, Peppermint Balls and Candy Canes.